It’s not fun to get the presentation slot first out on the morning after the conference dinner. But Katarina from Estonia got a good attendance and gave an interesting presentation on the zebra mussel (Dreissena polymorpha) and its impact on the ecosystem of the heavily eutrophicated Pärnu Bay in southern Estonia. Maillie Gall from Australia told A story of two sea urchins, in which she compared the population genetics of the two sea urchin species Heliocidaris erythrogramma and Heliocidaris tuberculata to see how far their larvae spreads. She has primarily examined whether the duration of the planktonic larval stage plays a role for the spreading distance. It was very nice to rest those weary eyes on some beautiful pictures of sea urchins and Australian waters. Jennifer Loxton held one of the conference’s coolest presentations, according to me. She showed how a bryozoan (phylum Bryozoa, it’s an animal) that came into English waters recently from Japan, reproduce like crazy. With movies and beautiful microscope images, we see that most of the currently known bryozoans form one egg bump per individual, where a larva is formed which then swims away and form a new colony. The Japanese moss animal produces up to five bumps, simultaneously! Unbelievable. The animal is red in color and thrives in cold water with high salinity, so we’ll probably not see it at the Swedish coast. Final speaker of the conference was Paul Somerfield from Plymouth Marine Laboratory, renowned marine biologist and statistician, who talked about how to use statistics and not place too much weight on that which is odd or rare if one wants to describe an overall pattern. The presentation was entitled “Putting the species back into community analysis “. Funny, easy to understand and relevant! The Baltic Sea is unique because of its low salinity. In the northernmost parts, the water is almost considered freshwater, whilst the salinity at the entrance/exit in Öresund lies around 15 psu (practical salinity unit, roughly equal to ‰ and denotes salinity). The low salinity of the Baltic Sea makes it a stressful environment for both freshwater and marine species, both groups lives on the very edge of their tolerance of either too high or too low salinity. 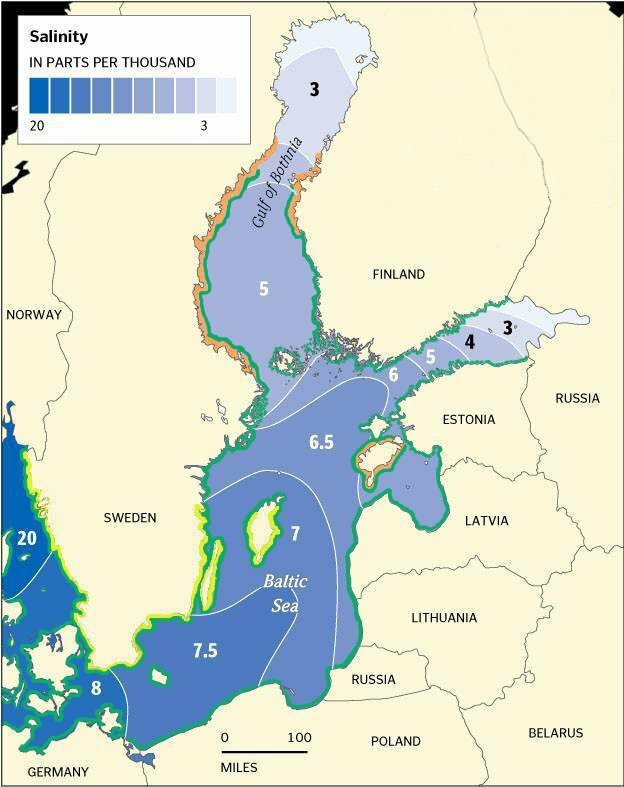 The map show surface water salinity and the distribution of the three species from the genus Fucus that can be found in the baltic Sea. Yellow denotes serrated wrack (Fucus serratus) Note that for this species only the distribution along the Swedish coasline is shown, since we have not found any data on its distribution in any other countries along the Baltic Sea.